Asahel Wellington Jones was a farmer, lawyer, banker, Lt. Governor of Ohio and Past Commander-in-Chief (PCinC) of the Sons of Veterans, having been elected at the 18th National Encampment in Detroit in September 1899. He served as Ohio Department Commander in 1897. PCinC Jones was born September 18, 1838 in Johnstonville, Trumbull County, Ohio. He was raised on a farm and educated in public schools. In 1859, he was admitted to the bar. He married Jeanette Palmer on September 24, 1861; she would die in 1901. In 1864, he moved to Youngstown, Ohio where he concentrated on personal injury lawsuits involving the railroads. He was elected Mahoning County, Ohio Prosecutor in 1869 and 1871. PCinC Jones was a delegate to the Republican National Convention in 1880. In December of 1884, he was elected President of the Ohio State Bar Association and Governor Foraker appointed him Judge Advocate General of Ohio. He was nominated in 1895 for Lt. Governor at the state Republican Convention and won that election; he would win re-election in 1897. In 1904, he married Louise Brice of Oberlin, Ohio, a graduate of Oberlin College (1). On October 9, 1918, PCinC Jones died at his home “Burghill” in Trumbull County, Ohio of heart disease. His wife, one daughter, Mrs. Kate King, and 4 grandchildren survived him (2). A.W. Jones was considered the leading candidate for Commander-in-Chief, others were Newton J. McGuire of Indianapolis, Indiana and Rev. W.J. Patton of Marinette, Wisconsin. Other considerations were resolutions fixing the 1900 Encampment at Chicago simultaneously with the Grand Army of the Republic (GAR) and ordering the Sons of Veterans (SV) camps with the GAR thereafter. Opinion was divided. Also delegates were desirous to eliminate the drills and military sections and make the order more of a civic and patriotic society with the officers to retain their present titles (3). 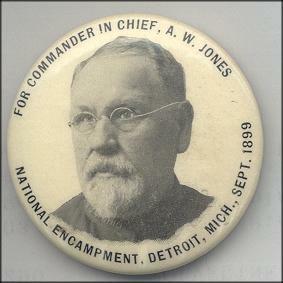 September 9th, the SV elected Asa W. Jones Commander-in-Chief, A.L. Solter of Des Moines, Iowa as Sr. Vice Commander-in-Chief and W.S. Raines, Battle Creek, Michigan as Jr. Vice Commander-in-Chief. Syracuse, New York was unanimously chosen as the next place of encampment(4).